The Tazzari Group, founded at 1963 at Imola in the heart of Italy’s Motor Valley, leads the way in aluminium foundry, precision mechanics and automotive industries. The Tazzari Zero is its first battery electric vehicle and debuted in the 2009 Bologna Motor Show. 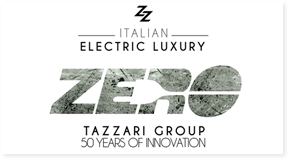 The Tazzari Zero uses a lithium-ion battery pack that delivers an all-electric range of 140 kilometers (87 mi). The car’s lithium-ion battery pack charge time is nine hours (standard charge) and the motor can accelerate the car to top speed of 100 km/h (62 mph). It’s also possible to charge batteries to 80% in 50 minutes using its Superfast charger. The aluminum-bodied car weighs only 542 kg (1,195 lb) with batteries. The car has normal options like: central locking, electric windows and mirrors, CD/MP3-player and 15-inch alloy wheels. The lightness of aluminium and the powerful, high-torque (150 Nm) mid-vehicle motor ensure outstanding acceleration. Dynamic, safe rear drive maximizes cornering control thanks to the wide wheelbase, the low barycentre, the perfect balance between front and rear axles and a chassis of motorsport-level technology unequaled in the city car category. Tazzari electric vehicles combine the easy handling of modern city cars with the thrill of a true, small sports vehicle thanks to unparalleled agility in city traffic and the user-friendliness of automatic transmission, a real bonus for an electric city car that can be parked in a space measuring less than 3 meters.